Good morning, readers! I’ve teamed up with Silly Bee’s Chickadees again in the Gift of the Melly Winter Collection, releasing tomorrow! My collaboration polish is called Jacki’s Reindeer Games and was inspired by a favorite classic holiday movie: Rudolph the Red Nosed Reindeer. With a white crelly base, red circles for Rudolph’s nose, brown hexes for his fur, and small iridescent glitters, it’s a perfect representation of the famous movie character! I had to pair this polish with an accent using my reindeer tutorial from last year. The most recent 40 Great Nail Art Ideas prompt is Things that Fly, and I totally think Rudolph fits the bill. Don’t you? Let’s take a closer look and don’t forget to check out the giveaway at the bottom of this post. 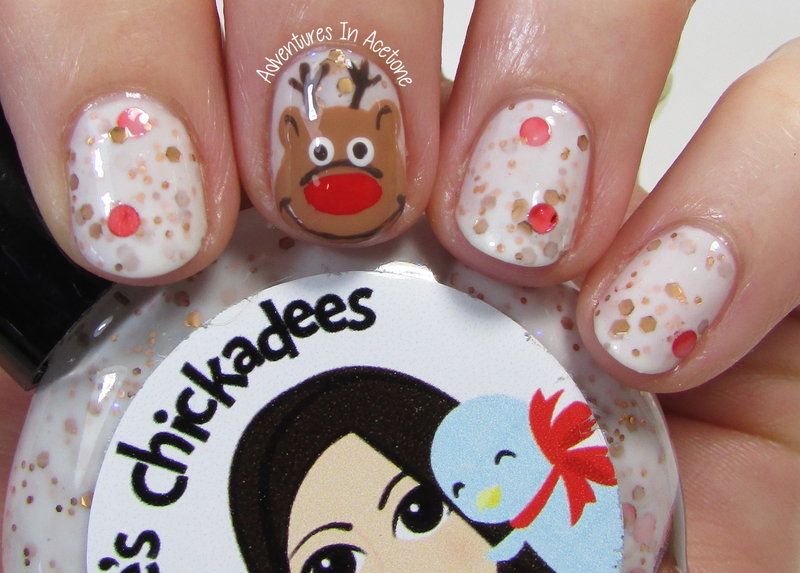 I’m showing three coats of Silly Bee’s Chickadees Jacki’s Reindeer Games in this mani, with an accent nail following my reindeer tutorial. The polish applies easily and I had no issues with application. The red dots are larger so some nails didn’t get any dots, while others got a couple. You can dig for more, but I was happy with a small amount of color pop. I love the softness of a while crelly– it’s much easier to wear than a stark white, and this allows the layers of glitter to show through nicely. My charity/organization of choice is Polished Girlz. $2 from each of Jacki’s Reindeer Games will go directly to them! Who wouldn’t want to spread the love of nail polish and sparkle to those in need? Polished Girlz paint nails and teach the importance of hand washing to those with special needs and frequently hospitalized patients. I am so happy to help support them with this polish. What do you think of my polish collaboration? I really love how it turned out and I hope you do, too. There are a limited number of bottles available starting tomorrow so don’t hesitate if you would like to own a bottle! It’s for a good cause, and is super fun! Are you a fan of the Rudolph the Red Nosed Reindeer movie? 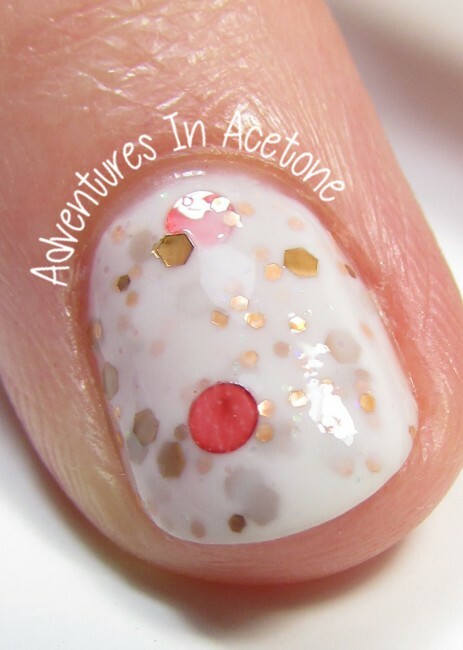 This would make a great Valentine’s Day polish as well! Jacki’s Reindeer Games will be available for $10 at the Silly Bee’s Chickadees shop below. Remember, $2 from each bottle sold goes directly to Polished Girlz! 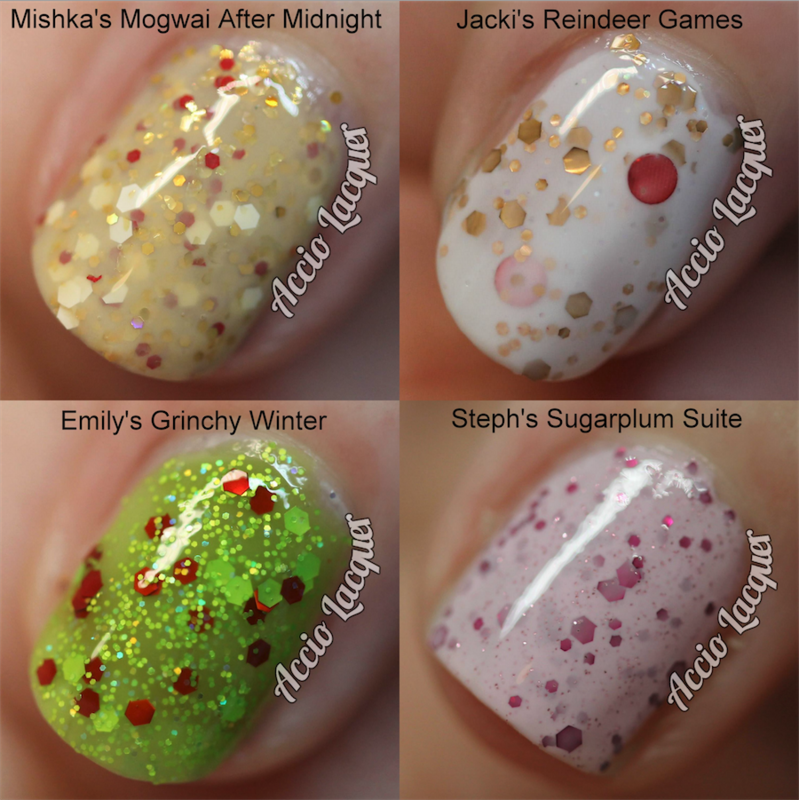 Take a look at the rest of the blogger collaboration polishes for this year’s Gift of the Melly below, photos courtesy of Accio Lacquer! Are you ready for the giveaway? One lucky winner will receive a full sized bottle of Silly Bee’s Chickadees Jacki’s Reindeer Games! The prize is sponsored by Silly Bee’s Chickadees and I’ll be the one mailing out, so only US addresses may enter the giveaway. (If you are international and have a friend in the US willing to receive and forward your prize to you, then you are welcome to enter.) Must be 18 or older to enter. This will end on Feb 2nd, so you have two weeks! Enter in the rafflecopter widget below! Good luck! *The polish in this post was sent for me to review with my honest opinion. This giveaway prize was sponsored by Silly Bee’s Chickadees. Too cute, I’d mainly wear it alone. This is so different! It is so cute with Rudolph, otherwise maybe a gingerbread man! I’d wear it alone or as an accent nail. I would wear it all the ways – alone, with some gold stamping, as an accent nail, with a freehand reindeer just like this one. One of my favourite ways to wear glitter crellies is to have it as my main polish, and do reverse accent nails on my ring finger (sometimes thumb too). I usually do a creme polish that matches one of the glitter colours. I love it!! I would wear it alone!! Thank yo life for the giveaway!!! It’s so beautiful that I would probably wear it alone or as an accent! It doesn’t need anything else! I would use it by itself. I like some accent nails but do not do one myself. Thanks so much. I think this is such a pretty polish! I’d wear it alone or as an accent nail.